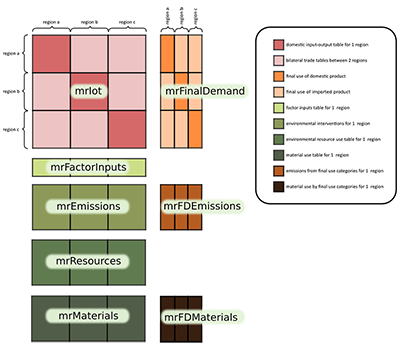 EXIOBASE is a global, detailed Multi-regional Environmentally Extended Supply and Use / Input Output (MR EE SUT/IOT) database. It was developed by harmonizing and detailing SUT for a large number of countries, estimating emissions and resource extractions by industry, linking the country EE SUT via trade to an MR EE SUT, and producing an MR EE IOT from this. 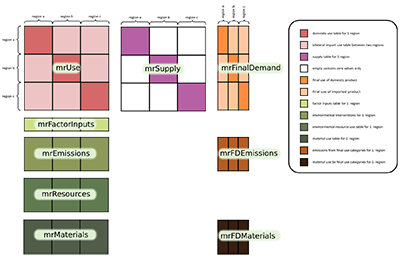 The international input-output table that can be used for the analysis of the environmental impacts associated with the final consumption of product groups. The EXIOBASE2 (base year 2007) is one of the most extensive EE-MRIO systems available worldwide. This holds also true for the water part (W-MRIO). A large number of products are covered and an especially high level of spatial detail is provided with regard to agricultural water consumption. Further detailed information on thermal freshwater emissions were incorporated in the database as well as data on emissions to freshwater of the most relevant nutrients. In this case study we carried out an extensive analysis of Europe's direct and indirect demand for water and the impacts created within and outside its borders. As such, the EXIOBASE2 is at the very forefront of W-MRIO development and application. We are proud to present this booklet, the result of years of hard work. 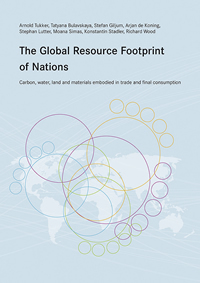 This is the first time, to our knowledge, that the total global environmental footprint – encompassing the carbon, water, land and material consumption footprint of various countries – has been compiled using one detailed, consistent and comprehensive global economic-environmental database. There is extensive documentation available in the Publications section.